Curtis and I live about 30 minutes from our church, so we have a lot of time to discuss our Sunday school lesson and sermon notes as we drive home. There is a certain point on the Katy Freeway feeder road that always reminds me to encourage my husband about the lesson he taught. Last Sunday we were rapidly approaching it and I had nothing. Stink! It wasn’t because his lesson wasn’t great. I honestly did not hear a word he said. Neither did I have any idea what our pastor’s sermon was about. I flashed back to February 1, 2009, which was the Sunday before Annabeth was born. I remember wondering why I bothered coming to church because all I could think, talk, or pray about was giving birth. Last Sunday I was completely consumed with thinking about an upcoming trip to Guatemala and I was literally good for nothing else. I realized it had been almost exactly nine months since I had been invited to join a group of bloggers on a trip to see Compassion International at work in Guatemala. And it was finally my due date! I was not getting a baby out of this experience, but I hoped I would be born new. 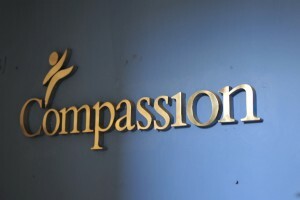 Curtis and I picked up our first Compassion sponsorship packet after a By the Tree concert when we were newlyweds. We have been blessed to partner with them in serving Marlon Alexander in Honduras for about seven years. Through his letters, we have been able to see him develop into a thoughtful and faith-filled young man. We were already fans of Compassion before I was approached about this trip, but I knew from my sister’s experience with them in India that I would be blown away by how truly excellent it is. In a nutshell, Compassion International is a child development organization that serves over one million children worldwide. Six hundred thousand sponsors are currently partnering with this organization to rescue children from poverty in Jesus’ name. Compassion’s aim is to be an advocate for children, to release them from their spiritual, economic, social and physical poverty, and enable them to become responsible and fulfilled Christian adults. This is largely achieved through monthly financial support from one sponsor to one child. Our team arrived in Guatemala City last night. I’d never met any of the other travelers in person, but after only 36 hours, I already think the world of them. The bloggers are Lindsey Nobles, Ann Voskamp, Lisa-Jo from The Gypsy Mama, and myself. The Compassion staffers are Shaun Groves, Dustin Hardage, amazing photographer Keely Scott, and my lovely roommate, Mrs. Patricia Jones! My sister called me right before I got to the airport to tell me how much she had loved Patricia on her Compassion trip to India in April of 2009. She is a wonderful lady with an amazing family. I’m hoping some of her mothering skills will absorb into my being while I sleep six feet away from her. 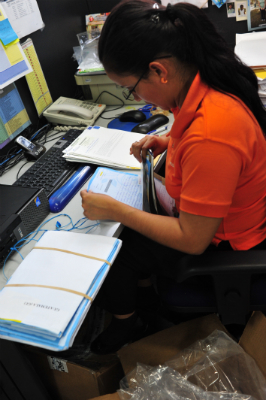 Our day started off with a trip to Compassion’s office here in Guatemala City. We got to see the various departments and meet the ladies and gentlemen who run the hub of Compassion’s activity in this country. There are 142 child development centers here that serve a total of 35,000 children. One of the most striking things about the office was that many of the desks were empty. The workers were busy out in the field! They did not have time to sit at those desks. I loved that. If you already sponsor a Compassion child, you can probably appreciate that my favorite part was meeting the correspondence staff. 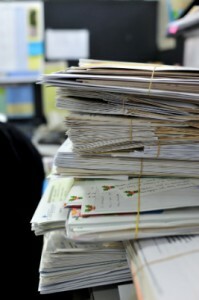 They were working hard at translating stacks and stacks of letters. 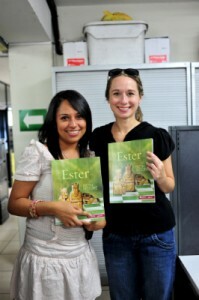 I took some of Mom’s Esther books in Spanish to give to the Compassion ladies. Later, we arrived at the Dios Habla Hoy (God Speaks Today) Student Center. 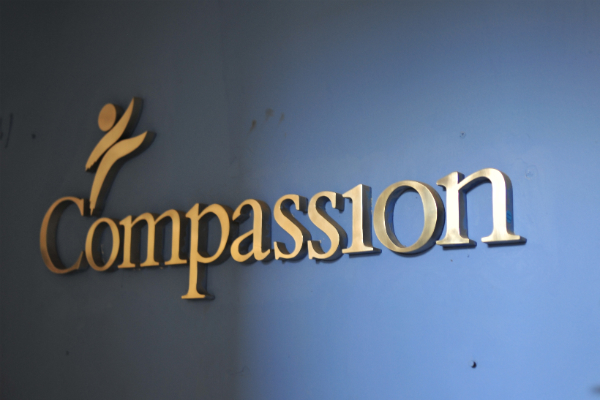 All of Compassion’s student centers are hosted in churches. Curtis and I are passionate about the local church and this aspect really appeals to me. More on that to come. As we started filing into the church, the deafening cheers of one hundred and fifty kids filled the air. There was a sea of beautiful smiling faces, wide eyes and waving hands. It was very humbling to be shown such love. 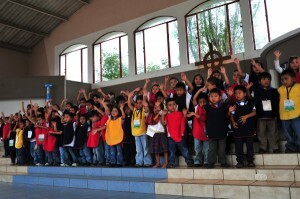 The children performed songs and recited memory verses they had learned. One by one, all the adult church members who volunteered in the program were introduced on stage. There were twenty of them. The presentation ended with a rousing rendition of a song you and I know as Lord You Are Good by Israel Houghton. Oh my word, I was doing everything humanly possible notto fall in a heap on the floor in full-on ugly cry. The kids were dancing their hearts out and singing these words in Spanish: Lord you are good and your mercy endureth forever…People from every nation and tongue, from generation to generation…We worship you for who you are…And you are good! Mom, I know you are reading this and I need you to know this was possibly the highlight of my life. Aside from my wedding and the births of my children. But it was high up there. We enjoyed getting to serve Pollo Campero to the children for lunch. It’s like the Chick-fil-a of Latin America. I finally got brave enough to try out my rusty Spanish on some of the kids while they were eating their chicken sandwiches. They just grin at you whether you say something right or not. After lunch the children went to their classrooms and we went around visiting each one. The kids seemed very happy to be there. Soon the children went home and we gathered with the project coordinator, the pastor of the church, and all the volunteer workers. The pastor spoke of how much the children meant to the church. The program is relatively new at only 16 months old. The church has eleven new families that became members after their children entered the program. A man who I believe worked as a tutor stood up and spoke with tears in his eyes. His older children serve there with him. A precious woman who is in charge of serving the food also spoke through tears about how much the children meant to her. She, too, serves there with her older children. I think the most profound thing I saw today was the beautiful relationship between Compassion and the local church. I expected to see the benefits the child development program on the children. I did not, however, expect to see the children having such an amazing effect on the church members. The children are served there twice a week and the volunteers admitted it was hard work. But the joy, fulfillment and energy that their presence brings to the church was palpable. It was clear that the children were highly valued. I was so moved that families were serving God there together. We have three more days to experience the Lord’s work through Compassion here in Guatemala City. Please pray for our team to be a blessing to the children, to the workers, and to the families. Pray that we will allow God to have His way with our hearts. Pray that hope and new life will be born in the poor and the rich. Gracias, hermanas! This entry was posted on Thursday, September 9th, 2010 at 12:14 am	and is filed under Amanda, Compassion. You can follow any responses to this entry through the RSS 2.0 feed. You can skip to the end and leave a response. Pinging is currently not allowed. How cool!! I grew up in church and I know there is absolutely nothing like knowing God at such an early age. I am praying for the ministry and all of you. Please write again soon! Oh Amanda, I got teary-eyed reading your post! So glad you went, sister! I would love to be there with you all, but I can only extend my love to you, the children, the staff and volunteers through prayers. I LOVE Compassion and the work they do. I especically love that it is done “in Jesus’ name.” I got involved about 8 years ago after picking up some packages at a Rebecca St James concert. I l-o-n-g to meet “my children” someday. Can’t wait to hear more about your trip. Oh Amanda, I LOVE Guatemala. My husband and I travel there every February to build homes at Casa Angelina (an orphanage in a village near Antigua). Part of my heart is still there, as yours will be. Enjoy every minute of your trip!! What I have found is that it IS true…in giving you receive! Enjoy being blessed! Amanda – I am praying for you and the Compassion team. I loved your pictures, and just teared up thinking about the children singing “Lord You Are Good.” I can’t wait to hear more! I enjoyed your sister’s blog posts so much when she was in India. I sponsor a little boy in Colombia named Iduar, and love writing to him and receiving letters from him. To get to physically hug him would be a dream come true! I love the Compassion organization. My first introduction was through Shaun Groves sharing at Travis Cottrell’s Jesus Saves Live recording event at First Baptist Woodstock, Georgia. I got a packet that very night and sent it in when I got home. My husband and I cry when we get Iduar’s letters. In the last letter he asked me if I liked to sing. My husband lost it – he is a worship pastor and it just got next to his heart. When you come home and see Jackson and Anna Beth, you will squeeze them a little tighter! My trip to South Africa changed me from the inside out last year, and I have no regrets. The children touched me the most. my introduction to Compassion was at that same concert. God changed some lives that night. I am just excited. I’m excited to see you, Amanda, stepping out and going to meet with this church and just delving into what God has there in Guatemala. I’m even more excited to see God moving in so many different aspects of our lives and the lives of those in this whole world. It’s absolutely incredible. And I know from experience that hearing little children, no matter the tribe, nation, or tongue, singing praises to our Abba! What a wonderful thing..I hope that childlike faith stays with them forever and rubs off on those of us who like to have control. WOW! Praying, still, for you and those with you. Be blessed! I have absolutely loved following all of you on this journey. I’m so thankful that you are there sharing with all of us the beauty of compassion. Praying over you all. Keeping you close to my heart. I am so excited for you to be in my birth country. myself and 2 of my three sisters were all born there. i am so jealous that you are there! and you ate Pollo Compero! i get so excited when Jesus sends believers to my country to share His love. i pray often that He will send more workers to the harvest there and it’s wonderful to hear that His children obey His calling. enjoy your time there and all He has for you. a beautiful country and beautiful people!!! love in Jesus from a guatemalteca! I am so happy for you and those kids! It just makes my heart full. My husband and I began sponsoring a toddler together through compassion when we were teenagers… years before we were married. Lorena is FIFTEEN now. :-O It melts my heart when she writes about hoping to meet us one day. Since my husband is a student pastor, it is so strange to think about how our sponsored “child” is now old enough to be in youth group! My brain just has a hard time processing that. We just got information in the mail saying that there would be a trip to the Dominican Republic in 2011, which is where our sponsored child is. I knew we probably couldn’t afford to go at this point in time, but I hopped online to check things out anyway… the trip is already booked up! Even though we can’t go, it just blesses my soul that others can… I love to see the church be the church. What a joy to read your post and see the pics of your experiences! A wonderful time of serving and worship for you all! I was in Houston for business this week, missed Beth due to client meetings, but I was so blessed by Curtis’ friend who filled in while he was with the little ones. He taught on Jude, and contending for the faith, being led by the Spirit, and there you are right in His will! Yay! So glad are you getting to go. I went with Compassion to Ethiopia last March, and it was amazing! To see God at work . . . everywhere. . . Helped me see how much bigger He is than I think He is. . . May you have many more blessings! Our little angel is from Indonesia. My son brought her home (her compassion international profile) from Lifefest- a christian music festival and asked if we could sponsor her. I told him that was worse than bringing home a puppy. How could I refuse? We are just getting to know her, but are so blessed to share what we have with her. Tears were shed by me as well seeing the pictures and hearing in my mind the children singing that song and praising God. Thank you for sharing! I’m so glad that you arrived there safely and you are experiencing so much. We too have a compassion child but in Peru. What an amazing experience and so glad you shared everything. It helps us understand even more what they do for these sweet children! I’m with your mom…I really teared up. 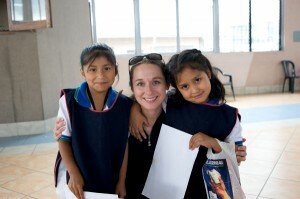 Sweet pictures and what a great way to serve the children. So happy you were able to make it and I know your time will be so blessed by God. Thanks for sharing and We’ll keep praying for you and your team. I loved reading this post, I sponsor a Compassion child myself (she is already 18 years old!) and it is so good to hear a firsthand account of some of the work that Compassion is doing. It will add fuel to my prayers for her! How could your smile, your faith and beautiful heart do ANYTHING other than bring blessings? However, I will pray for that since you requested it! I will also pray for your darling family back at home to remain safe until their Mama returns as I know that leaving your family was heavy on your heart before you left! Savor every moment of this experience and know that God has your back! You know that! Thank you for going on this trip. My Compassion child is in Guatemala, I’ve made three mission trips to this awesome country and I know you will be blessed. Praying for an awesome trip. Thank you for your post. I apparently live in a box because I have not heard of Compassion ministries. I do have a heart for missions. I pray for you, the staff and all the children with Compassion ministries. Wow! Sounds like a good trip you’re having. Thanks for keeping us updated. To be obedient and to sense His pleasure, what more could you ask?! Yes, right up there with your most treasured moments. I am thrilled for you. Love them all each one! for us; for you are our representation, too. Safe travels home for you and the entire team, praying for that. What a wonderful opportunity! It is great that you were able to travel to Guatemala to see God at work there. (What a beautiful country!) Right now my ministry focus is at home with my active and strong willed boys. My heart is totally with you. I yearn to one day, once again serve those in need – both in my city and beyond the borders of our wealthy country. Thanks for sharing! Many blessings. Oh how you make my heart yearn for Guatemala! I just returned from Zacapa (3 hrs west of Guat. city) in July, where a group of young ladies hosted a girl’s retreat for orphans and village girls. My husband and I go every other January to minister with the organization, Hope of Life. One of our favorite parts is being in the Mayan jungle. I was so happy to hear you took one of your Mom’s Bible studies. I have discovered that there is a strong thrust for evangelism but a great need for discipleship. I am praying that these beautiful people will be built up in Christ! Thanks for sharing your journey. You will never be the same! How like your Mom you can say and do just the right things to stir the Spirit of the Lord in a woman’s heart. 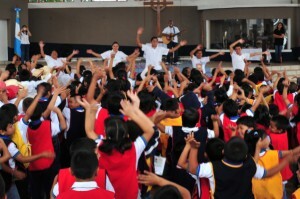 I had tears in my eyes just seeing the pic of the children with arms raised singing “Lord you are good”. He is good and your trip is proof that He is alive. Prayers for safe travels and that the Lord will continue to move throughout the nations through work like that of Compassion. Thank you! I’m so encouraged by your passion and involving yourself personally in this effort. The world is in our “backyard” now and how can we not respond? May God Bless You as you travel and bring all God has planned to enrich your life and the lives you touch- bringing Christ’s love. Loved your post! This summer at Student Life Camp, my daughter (who is adopted) chose a Compassion Child to sponsor. I am overwhelmed by God’s mercy and grace as I see her share the love of God with another. That was beautiful!!! 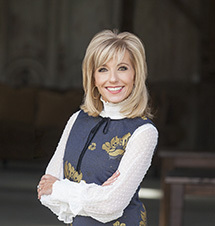 My compassion child left the program last year, and I did not pick up another due to husbands job loss. After reading your post I am praying about sponsoring a new child – thank you.